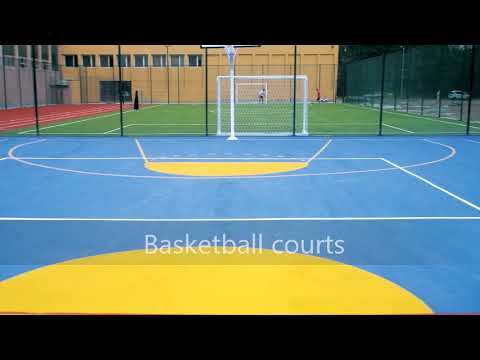 Outdoor resilient, medium-hard acrylic flooring system ideal for surrounding areas in sports grounds, cycling tracks, parks, pathways etc. Combination of wet-pour acrylic coatings in total average thickness of 2.2 mm. 1. RITIVEX R LIQUID 1102 - Acrylic primer. Used as primer of acrylic coatings, such as ELASTOSPORT 853. 2. ELASTOSPORT 853 – Acrylic, one component, smoothing and repairing wet-pour resurfacer for sports floors systems. Consists of acrylic resins, quartz sand and special improvers. ELASTOSPORT 853 is applied by squeegee on dry compact asphalt to seal the porosity and smooth out the surface before the application of CORRIDOL 864. Highly resistant to adverse weather conditions (snow, frost heat waves, etc.) after drying. 3. CORRIDOL 864 – Acrylic, slip-resistant coating for outdoor surfaces. It is applied by squeegee on waterproof, smooth, concrete surfaces, without rising humidity issues, or asphalt surfaces. Prior application of ELASTOSPORT 853 is recommended to fill in and smooth out the underlying substrate. Highly resistant to adverse weather conditions (snow, frost, heat waves etc.) after drying.